I don’t know about you, but I am a little bit nosey. I love taking a peek into someone else’s life, and I am guessing if you are reading this, you might too. 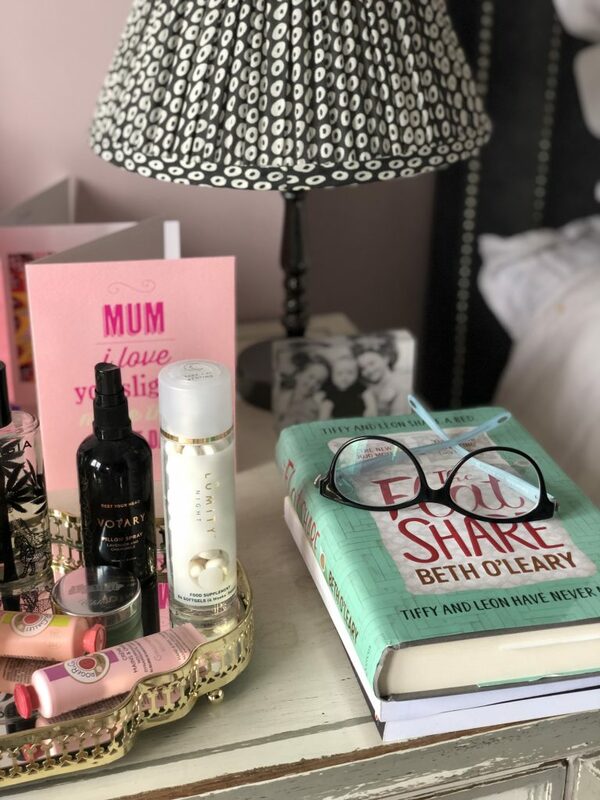 So today’s post is a little peek at what is on my bedside table. If we’re being pedantic, it’s actually more of a bedside chest, after a little furniture move I had this week. (My husband plays ‘spot the change’ almost on a daily basis. There are very few days that go by that I haven’t moved something in our house!) I replaced my little bedside table with my chest of drawers from the other side of the room. Purely practical reasons – it was just too small for my bedtime armoury! It’s worth noting that this is a real time snap – there has been no styling or editing for the purpose of this post. So what’s on your bedside table? My book. Current read is The Flatshare by Beth O’Leary which I am really enjoying. A light, entertaining and easy read so far. My goal for this year was to read more and so far, so good. I aim for 5 pages a night and I have really stuck to it, and often end up reading way more. I try to make sure that the page of a book is the last thing I look at every night. A candle or two (or three!) I light a candle every night. It’s part of my nightly ritual of winding down. My old favourites are Jo Malone, Diptique and the White Company but I have recently discovered Brown and Drury candles through Instagram and the ‘Warrick Sandalwood and Leather’ fragrance is definitely my new favourite. Lip balm – I always have a pot of lipsalve at my bedside. 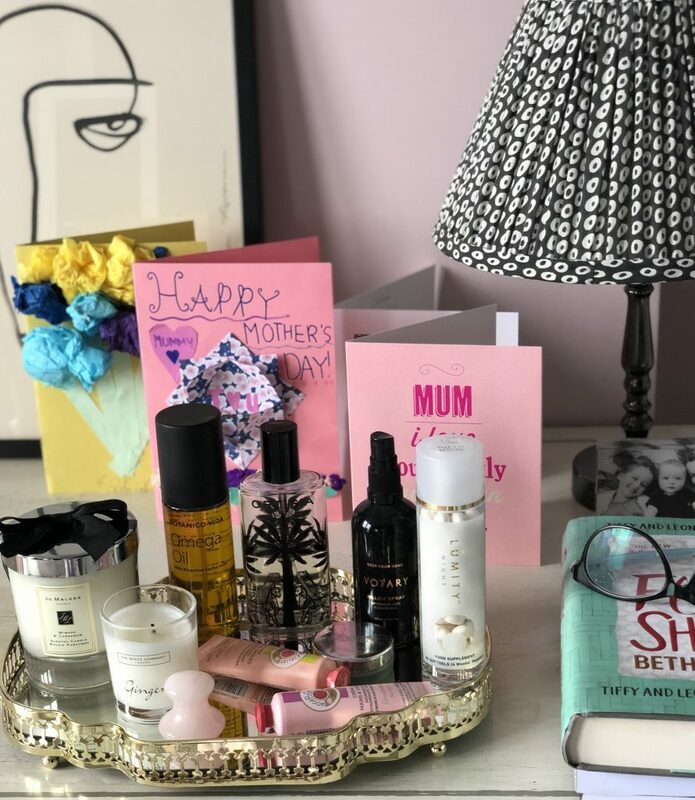 Favourites include Eve Lom Kiss Mix (£16), Base Lipsolve (£7.50) which contains liquorice root and is meant to keep the Herpes virus at bay if you are a cold sore sufferer, Lanolips and my current pot of La Mer the Lip Balm which was a lovely gift from La Mer, but at £52, probably not something I would buy for myself! Ortigia Room Essence – I treat myself to a bottle of this twice a year. I love spraying it around the room and on the linen on sheet change day. My favourite fragrances are Fico D’India and Lime de Sicilia. 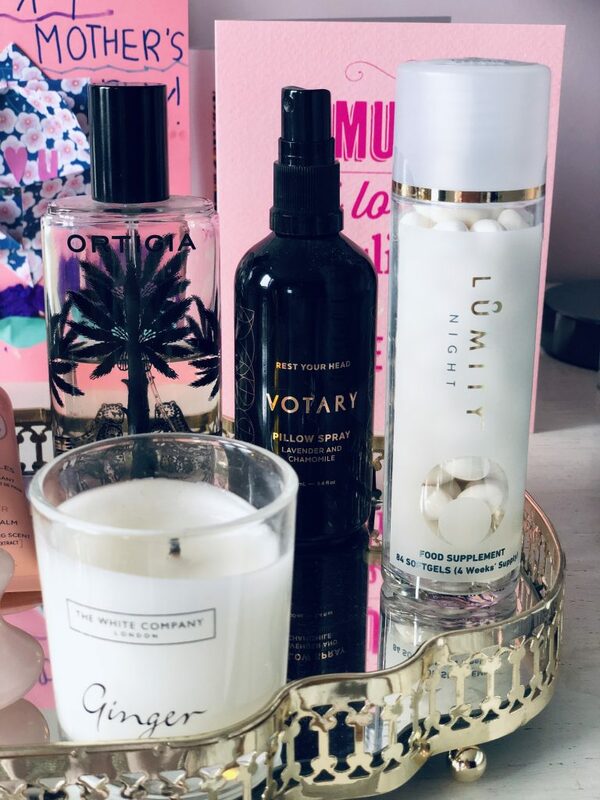 Votary Pillow Spray (£30) – I don’t use a pillow spray every night, but often if I am feeling a little wound up by a busy day (or an annoying teen!) I’ll spray my pillow to help me sleep. This one from Votary has Lavender and Chamomile to calm the senses. Botanica Vida Omega Oil (£11.50) – I was sent this to try recently and I absolutely love it. I was bitten by something recently (spider or a vicious mosquito) and it has left really unsightly bite marks and bumps on my upper arms and thighs, so I have been using this oil to try and fade them. ‘Botanica Vida Omega Oil is the only 100% NATURAL and CLINICALLY PROVEN dry skin, stretch mark, scar and ageing skin treatment on the market. A Plant Based Omega Oil that delivers the cell renewing qualities of Omega 3 directly to your skin.’ I used to use Bio Oil for this kind of thing, but I prefer this one as it seems to absorb into the skin quicker. Rose Quartz Guasha Stone (£8.99) – that’s the pink mushroom looking stone on the tray. I was given it recently at a Rosalena event and really love using it once I jump into bed after applying my facial oil, which is the last step in my nighttime face routine. It stimulates circulation and lymph drainage while massaging the skin and underlying muscles of your face, neck and eye area. I prefer this to my jade roller. Lumity Night Capsules – I stopped taking these for a few months recently and really noticed a difference in my skin, so I’ve started again. 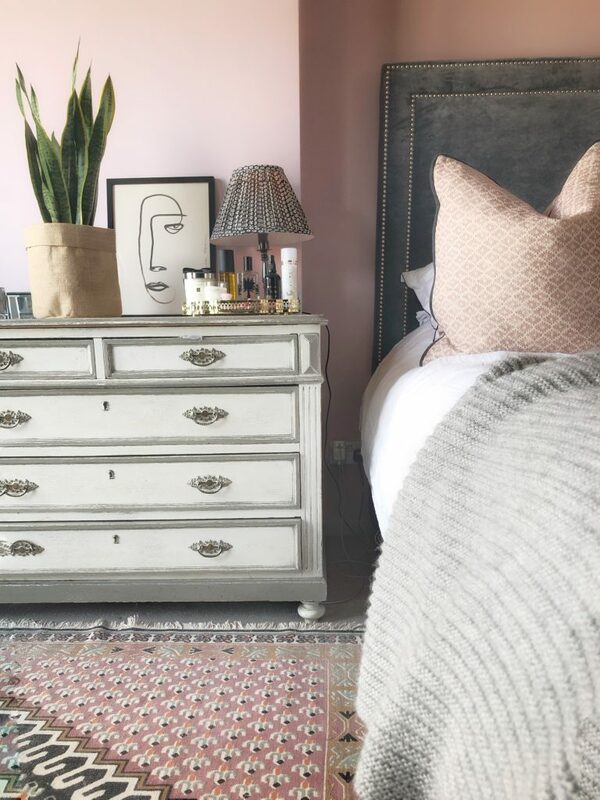 Bed and bespoke Pink cushion from LoveYourHome , grey blanket from Also Home. Rug from French Connection, Plant from Patchplants. I hope you’ve enjoyed this post. 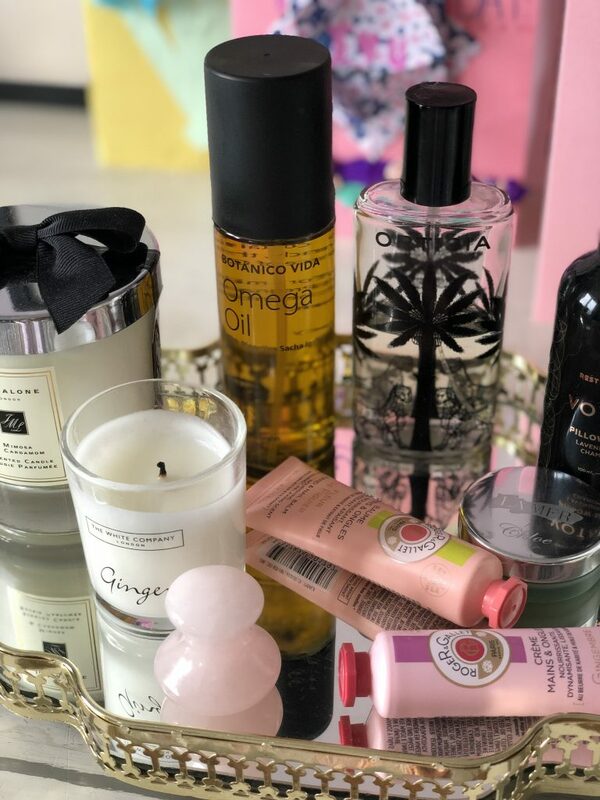 I have been thinking about starting a series on the blog where I ask the founders of a few independent brands and small business owners that I love to tell us what’s on their bedside table. Is that something you’d like to read? Let me know! That would be a great idea for a series as it’s always interesting to see what people really use. Yes! I am a nosey parker! I love seeing how other people live. I always have a book on my bedside table, usually my kindle. I also have hand cream, and my night cream as well as eight hour lip balm. And apart from my alarm clock and light that’s about it! Oh yes, I’m nosey too (it’s only polite to take an interest in people, isn’t it?). I have a very similar – though less picturesque – haul next to my bed. I’d be interested in your idea. Hi Pam- sorry for the confusion, yes I Linked a cheaper one I found on Amazon as I didn’t think there would be much difference, but I have the Rosalena one.